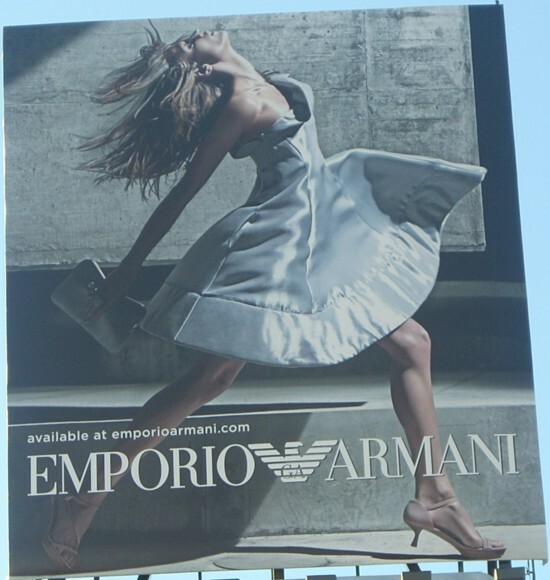 This graphic is similar in theme to Emporio Armani’s urban Amazon billboard, installed in the same location at the end of 2010. Again, the living flesh tones and action of the model contrast with the dead stone gray of the streetscape. Here the Armani-clad blond emerges from the shadows, where in the other ad the urban Amazon stepped out of a fog. Armani’s new 2011 graphic shows a determined long-legged stride powered by large feet in high heels. With the wind quite clearly in her sails, this young lady’s clothes appear about to take off in the breeze. Reminiscent of the iconic image of Marilyn Monroe barely able to hold down a billowing dress, the ad taps into dreams of being naked in public. The head and neck of Armani’s Miss are now horizontal and the rest of the body might be expected to follow.